The risk for developing certain diseases increases with age. That is why it is common for older adults to suffer from health issues like heart disease, cancer, obesity and diabetes. If you want to live a long and healthy life, you need to take good care of your health as you age. Successful aging means being free from disability and diseases associated with growing old. The researchers found that participants who had the highest dietary fiber intake were more likely to live over the next 10 years without suffering from hypertension, diabetes or functional disability. Soluble fiber helps reduce the absorption of bad cholesterol in the blood. It binds with cholesterol and bile acids in the intestines and removes it from the body thereby preventing re-absorption of cholesterol. Thus, fiber can help lower blood cholesterol and decreases the risk for cardiovascular disease. Insoluble fiber absorbs water like a sponge, detoxifies the intestines and adds bulk to stool stimulating regular bowel movement. Thus, fiber can help prevent constipation, irregular stools, hemorrhoids, diverticulosis and may lower risk for colon cancer. Consuming fiber helps people with diabetes regulate and stabilize their blood glucose levels. Soluble fiber can help slow down the absorption of sugar in the body thus reducing the sudden rise of sugar levels in the blood. Thus, eating fiber-rich foods can help prevent a sudden spike in blood sugar levels. In addition, consumption of insoluble fiber may also help reduce one's risk of developing Type 2 diabetes. Fiber gives a feeling of fullness. People who eat high-fiber foods tend to feel full longer. So, they have better control of their calorie intake and avoid being overweight or becoming obese. Soluble fiber encourages the growth of good bacteria in the gut. These bacteria that ferment fiber can produce short chain fatty acids (SCFAs), which help improve the health of the immune and digestive system. SCFAs are also known to prevent leaky gut, which is a problem often linked to Type 1 diabetes and other autoimmune disorders. 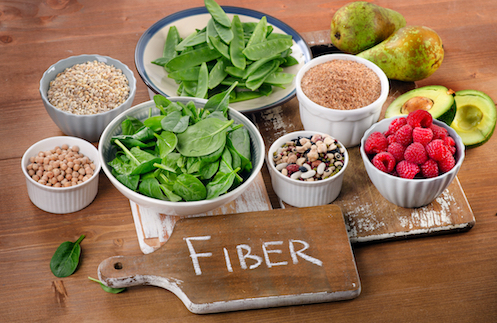 Fiber plays an important role in your health as you age. Make it a point to include high-fiber foods in your regular diet. Most fruits, vegetables, whole grains, nuts and lentils are rich in fiber. 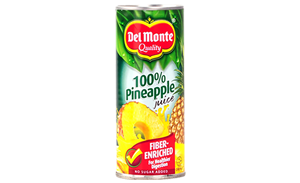 You can also get your daily fiber fix by drinking a can of Del Monte Fiber-Enriched 100% Pineapple Juice to add 4 grams of dietary fiber, equivalent of a 200-gram bowl of salad, to your daily diet.